The Heroes of the Storm Chinese Qualifiers are now finished. The 2015 HWC – Championship is the Chinese qualifiers which were organized by NetEase and NeoTV in conjunction with Blizzard. Eight teams were qualified in which two, the finalists, would book tickets to the Heroes of the Storm World Championships in Anaheim, California. The tournament format was double elimination with the round of 8 having best of three matches. The grand finals were a best of seven affair with the winners bracket finalists having a one game advantage in the grand finals. 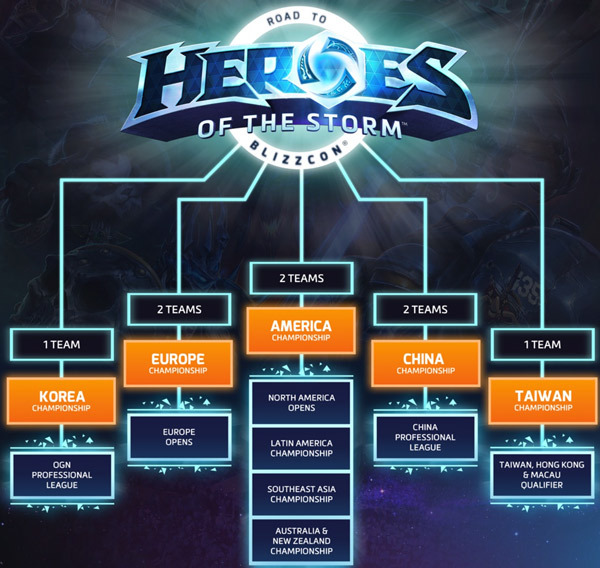 The two teams will now join the other qualifiers from each of the regions in the Heroes of the Storm World Championships to be held during BlizzCon on November 6th to the 7th 2015 at the Anaheim Convention Center, Anaheim, California. The road to the Heroes of the Storm World Championships starts with the regional qualifiers. Korea is one of the countries known to take their e-sports seriously, so it is not a wonder that they would have their own Heroes of the Storm World championship qualifier. The 2015 HOT6 Heroes of the Storm Super League will serve as the regional qualifier for the main event at Anaheim, California. The 2015 HOT6 Heroes of the Storm Super League started on August 9, 2015 and will run up to October 3, 2015. The tournament will be divided into two stages. The first stage is where the teams are divided into two groups. The teams will then face each other in a best of 5 single round-robin. The top two teams in each group will now advance into the playoffs. The playoffs are a double elimination affair, with all the games in a best of five and the grand finals a best of seven match. The winner will advance as the Korean representative to the Heroes of the Storm World Championships along with pocketing the top prize of ₩ 50,000,000.00.